As the sun rises over Launch Pad 39A at NASA's Kennedy Space Center in Florida, workers get ready to roll the rotating service structure away from space shuttle Endeavour in preparation for launch. Thisstory was updated at 5:42 a.m. ET. CAPECANAVERAL, Fla. ? Thick clouds thwarted the attempted predawn launch of NASA?sspace shuttle Endeavour on Sunday, forcing the orbiter?s six-astronaut crew towait at least one more day before rocketing into orbit. Despiteearly predictions of good weather, a thick layer of low-lying clouds crept inover NASA?s Kennedy Space Center here, preventing Endeavour?s planned 4:39 a.m.EST (0939 GMT) launch toward the International Space Station. The astronautswere already strapped inside their seats awaiting liftoff. 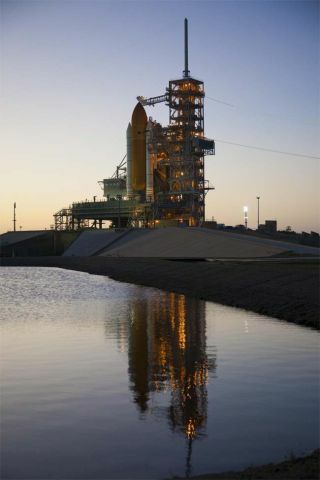 ?Wewere just not comfortable with launching the space shuttle tonight so we?regoing to go into a 24-hour scrub,? NASA launch director Mike Leinbach radioedEndeavour?s crew. ?Thank you all for the effort you all put in tonight.? ?Yougave it a great try tonight. Sometimes you?ve got to just make the call,?Endeavour commander George Zamka replied. ?We understand and we?ll give itanother try tomorrow.? Endeavouris now slated to launch on Monday at 4:14 a.m. EST (0914 GMT, NASA testdirector Pete Nickolenko said after the launch attempt. There is a 60 percentchance of good weather predicted for Monday, NASA officials added. Thethick cloud layer for Sunday?s launch was hovering at about 3,800 feet aboveEndeavour?s launch sit. The layer was about 600 feet thick. It was a dynamicsituation, with conditions wavering back and forth between acceptable andunacceptable for launch. At one point, Leinbach said he had never seen anythinglike the observed weather in his entire career as a shuttle launch director. NASA?sspace shuttle flight rules require cloud ceilings no lower than 4,000 feet andno thicker than 500 feet, Nickolenko said. Endeavour?ssix-astronaut crew plans to fly a 13-daymission to deliver a new room and observationdeck to the International Space Station. Themission is the first of NASA?s five final shuttle missions before retiring itsaging space shuttle fleet later this year. Endeavourhas just one more chance to lift off (Monday?s opportunity) before NASA wouldstand down in order to launch the new SolarDynamics Observatory ? a sun-watching probe ? atop an unmanned Atlas 5rocket. That mission is now set to launch Feb. 10 from the Cape Canaveral AirForce Station near the Kennedy Space Center. Ittakes about two days for NASA and the Air Force to turn around the EasternRange they share for rocket and shuttle launches. SPACE.comis providing complete coverage of Endeavour's STS-130 mission to theInternational Space Station with Managing Editor Tariq Malik in Cape Canaveraland Staff Writer Clara Moskowitz in New York. Click here for shuttlemission updates and a link to NASA TV.